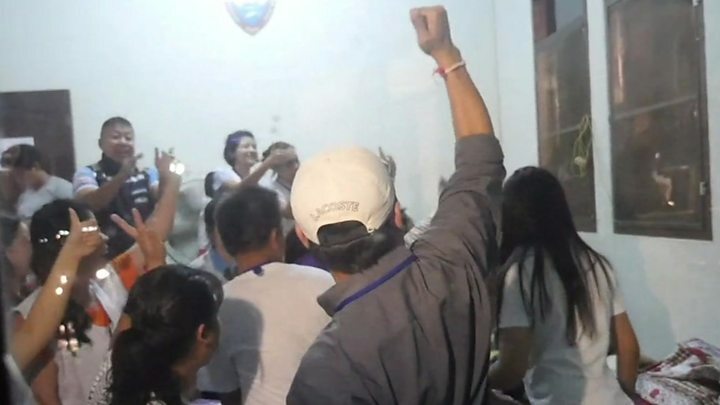 It's a scene of joy and relief across Thailand after 12 boys and their football coach were found after being trapped for nine days in a flooded cave. Relatives who had for days been gathered outside the cave waiting for news cheered as they heard the group had been found by British rescue divers in the Tham Luang cave complex. Thousands of people have also used social media to celebrate with a hashtag that simply says: "13 Survived". More than 1,000 people were involved in the extensive search operation, which saw naval divers, military officers and rescue workers band together in the region of Chiang Rai. "I'm delighted. I don't know how to describe it in words... it's unimaginable," the father of one of the boys said when he heard the news. "I've been waiting for 10 days. I never imagined this day would come... I just want to see my son and hug him, that's more than enough." Across social media, there was an outpouring of relief and thanks, with many posting with the hashtag #13Survived. One picture imagined the group as boar piglets, a reference to the name of their football team, Moo Pa - or wild boars. "Everyone who helped the 13 people is a hero," said one user on Twitter. "We are shedding tears of joy." But though the boys, who are aged between 11 and 16, have been found - it might be a while before they are able to leave the cave. Thailand is currently in the midst of its rainy season, which lasts until September or October, so it could be months before floodwaters inside the cave recede. How can rescuers free the boys? If the children are to be brought out before then, they will have to learn basic diving skills. But experts have cautioned that taking inexperienced divers through the dangerous corridors of muddy, zero-visibility waters would be a very dangerous operation. If they are to wait until the water recedes by itself, it would mean the boys will have to stay in the cave for months and have to be continuously supplied with food and assistance. Rescuers are currently working to bring more supplies to them and they may need to have food sent in for at least the next four months, according to the military.